Microsoft announced ‘Microsoft Teams’ on 14 March 2017 at an event in New York launching the service worldwide. Microsoft Teams is a cloud-based communication application which is primarily used for collaboration purposes as part of the Office 365 suite. Teams leverages identities stored in Azure Active Directory as well as providing flexibility for participation with external guests. When any new team is created in MS Teams an Office 365 group and SharePoint Team site are created automatically as part of the back end functionality. 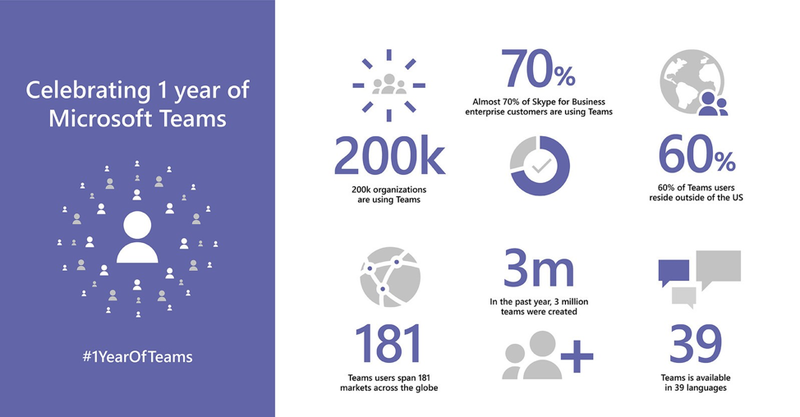 Microsoft has previously tweeted: “Ahead of its release last year, Microsoft said Teams was already in used by more than 30,000 organisations, and that number quickly grew to over 125,000 organisations six months after launch. According to Microsoft's latest tally, 200,000 organisations are now using Teams across 181 markets and in 39 languages. Three million teams have been created in the year since Teams' launch. Also, it is remarkable that 70% of Skype For Business users are moving to MS Teams”. MS Teams has evolved over the last year to become an ultimate hub for communication, team working and collaboration. Teams delivers chat-based collaboration, meetings, online calling and voice calling as well as video conference calling, and on the next update: full enterprise voice features. Cloud Recording: Users can record their meetings. This feature is already rolled out in October 2018. This feature automatically uploads the recorded meeting in MS Streams. Inline Message Translation: Microsoft Teams now supports inline translation for messages and personal chats. The translation is done by Microsoft Translator for over 60 languages, and it works well. Cortana voice interactions for Teams-enabled devices: Users can use natural language to make a call, join a meeting or add a people in the meeting. This functionality will be extended to all IP Phones and Conference phones. Background blur on video: This is the solid feature rolled out by Microsoft during July 2018. Now, for any important meetings, if you are on crowded place, you don’t need to worry about the place. Microsoft Teams blur your outer background and attendees can only view your face. Proximity detection for Teams Meetings: This feature can make your meetings simpler is proximity detection. When you enter a room equipped with a Teams meeting room device, Proximity Detection will automatically detect your Teams-enabled meeting room laptop and prompt connection for you to join the Teams meeting room. This helps you save time finding an available room, so you can immediately connect with other users. Mobile sharing in meetings: Sometimes there are situations in which we need to join the sudden and unexpected meetings and we only have our mobile device with us. Mobile Sharing in Meetings allow us to share a live video stream, photos, or your phone screen with other attendees immediately. Educational institutes use teams for their students to make the educational experience streamlined and accountable. Software Industry uses teams to manage internal conversations, integrate teams with planner and chat-based conversations. Healthcare industries uses MS Teams because of secure messaging as well as the functionality of image annotation. If your organisation is planning to move onto any collaborative platform, we advocate MS Teams which has proven itself best for business. Our experienced architects and developers provide the perfect road map to plan MS Teams integration within any organisation.